The Sawin Memorial Building, which houses the Sawin Museum, was a gift of Benjamin Nelson Sawin and his second wife, Sarah Eudora Shumway, whom he married in 1893. Mr. Sawin's first wife, Mary Jane Bacon, died in 1888. Both Benjamin and Eudora were active members of the Dover Historical Society. The Sawin's were not wealthy for Benjamin was a farmer. They were, however, generous with what they had and were concerned about preserving Dover's history. They left the land on which the museum sits and all of their property to the Society for the erection of the Sawin Memorial Building, which was completed in 1906 and dedicated on May 14, 1907. The Museum's collection policy stresses the material culture and holds a strong farm tool collection (housed at the Fisher Barn) as well as a fine children's clothing collection, a kitchen collection, the beginning of a general clothing collection and documents and photographs across the period of the town's history. The Dover Historical and Natural History Society of Dover and Vicinity was organized in 1895 and incorporated on September 1st, 1900. The Sawin Memorial Building was built by the Society in 1907, with funds from the bequests of Benjamin Nelson Sawin and his wife, Sarah Eudora (Shumway) Sawin. Ben Sawin served the Town of Dover as Selectman, Asssessor, member of the School Committee, Park Commissioner, and Cemetary Commissioner. He was a founder of the Needham Farmers and Mechanics Association, and was an influential member of the Dover Grange, Patrons of Husbandry No, 177. He was, basically, a highly successful and innovative farmer. But Ben Sawin was famous beyond Dover for The Grove, his property on the banks of the Charles on Claybrook Road. The Dance Pavilion was the main attraction of The Grove, but one could also rent canoes or rowboats. There was a cook house to warm up food brought to be consumed in the picnic area. There were also playing fields on which to pass an energetic summer day. By 1904, people came from the surrounding towns and even Boston on the Natick and Needham Street Railway, which deposited them at the end of Turtle Lane. From there it was a half mile walk to The Grove, along Main Street and Claybrook Road. 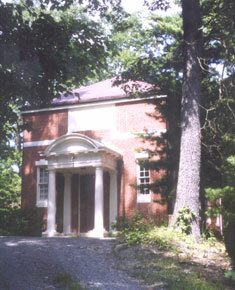 Both Ben and Sarah left their estates to the Society for the benefit of the Town and its citizens in the form of the Sawin Memorial Building, which served the Society as a museum. Ben designated a building committee, made up of Eben Higgins, George E. Chickering, and George L. Howe. At the dedication of the Sawin Memorial Builiding on May 14th, 1907, Eben Higgins handed the keys to the building to George Howe, president of the Society.